After his stunning knockout victory over Aaron Pico, Henry Corrales is hoping for a rematch against Bellator featherweight champion Patricio Freire. Despite having competed in Bellator since 2015, Henry Corrales picked up the highest-profile victory of his career against six-fight veteran Aaron Pico. 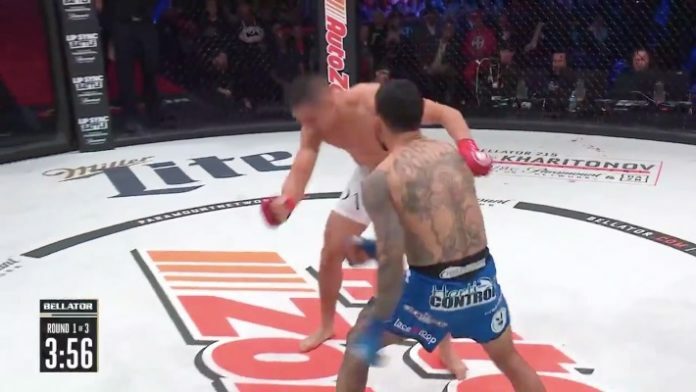 Corrales knocked Pico out in stunning fashion at Bellator 214 this past weekend (Sat. January 26, 2019). The victory made the fifth-straight win for Corrales inside the cage. Corrales and Freire previously competed against one another back at Bellator 153 in 2016. The featherweight champ submitted Corrales in the second round via guillotine choke. He has since gone on to recapture the Bellator 145-pound title. Now, after having put together an impressive win streak, and knocking off one of the sport’s biggest prospects, Corrales might have earned himself a rematch. Do you think Corrales should get a shot at the Bellator featherweight title next?